"Congratulations Team GB. I heard you got another two gold medals today. Not that I care. I'm from Ireland. You lot have won more Golds at these Games than we have in our entire Olympic history. Best of luck to you." This is the playful patter of a random Games Maker whom we passed in the Olympic Park — a typical spark of character from one of the 70,000 volunteers drafted in to make the Games work. And work they did. Even the most miserable cynic must admit that the staging of the Olympics was peerless, unless you want to pun about Lord Coe. This success is borne of both ends: them in charge; and us, the masses. Coe and his committee pulled off one of the greatest feats of top-down planning in sporting history. Hats have to be taken off, and in some cases eaten, at what they've delivered over the past two weeks: world-class sport, medal glory for Team GB, no big Games-time scandals, record-breaking crowds, the greenest Olympics ever, and a near faultless transport network that surprised everyone. Danny Boyle set the tone with an ebullient Opening Ceremony, while the closing finale...well, let's just park that one for now. 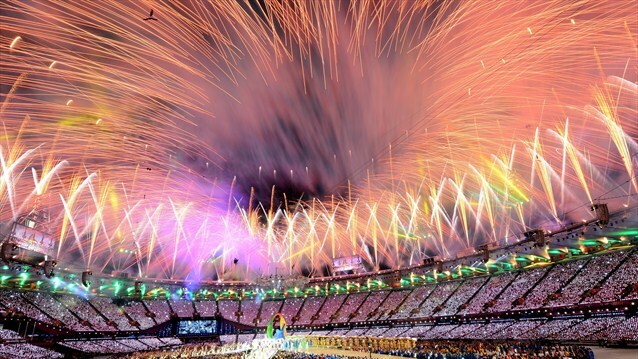 The public's contribution has been the brightest element of these Olympics. Our Games Makers totally nailed it. The purple-shirted volunteers were cheery and positive to a fault, yet rarely slipped into "have a nice day" wooden hospitality. Whoever trained our plum-garbed chums clearly had a "be yourself" mantra. The result was an army of individuals who wore the same uniform but not the same personality, from the jaunty Irish fellow quoted up top, to the deadpan megaphone delivery of this YouTube mini-star. They deservedly received the biggest applause during the Closing Ceremony. The London Olympics at least felt like the People's Games, despite the ubiquitous sponsorship and branding, because of their sense of fun under pressure. The Olympics might be over, but the story of London 2012 is not. We still have the Paralympic Games to look forward to. These already promise to be the most successful of all time, at least in terms of attendance. Further ahead, there's much to keep journalists, columnists and Londonistas in copy for years to come. How will the Park be redeveloped? Who will use the venues? How can the optimism, sporting achievements and volunteer culture be harnessed? Were these indeed the best Games ever? Might we have even made a profit, if you cook the books in a Heatherwick cauldron? This is a rare historical moment. Like any big city, the most picked-over entries in London's chronology are negative — riots, bombings, economic crises. For many people, these Olympics have provided an emphatically positive and sustained high-point that has no equivalent in recent history. Even those perma-jolly cheer-mascots, Manlock and Wendyville (or whatever) must be moist with glee at how well it's gone. Lest we forget, there were low points, too. We all cringed at that early mix-up, in which the women's football team of North Korea was shown under the South's flag. Occasional doping accusations and disqualifications were inevitable, if comparatively minimal. While Team GB's cyclists powered to glory, last month's Critical Mass bike ride turned ugly amid claims of police heavy-handedness that remain under-explained. Another cyclist lost his life after a collision with a shuttle bus near the Olympic Park. There will be further setbacks, hangovers and controversies as we move into the post-Olympic period. The question of whether this huge, costly, glorious, disruptive project was worthwhile can be answered in a thousand different ways depending on your standpoint and agenda, and so will never be satisfactorily answered. But setting aside what came before and what is yet to come, we can be proud of 16 days of glory that showed Londoners and other Brits at their very best. Now, bring on the Paralympics. And when does the bidding start for the 2026 World Cup?